Our Steiff 1929 Replica Teddy Bear is fully jointed and made of the finest white mohair. This beautiful piece wears the famous underscored patinated steel Steiff button in ear and is a limited edition of only 1000 pieces worldwide. Product details: glass eyes,wood shaving filling (just like the original), growler, total size 40cm. Comes boxed, together with a certificate of authenticity. 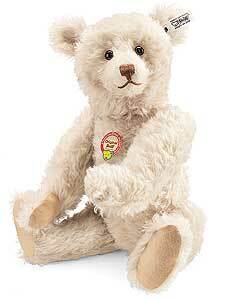 Almost everyone would like to own an antique Steiff Teddy bear. But desirable Teddy bears are growing more and more scarce each day. And higher prices for originals are often beyond the reach of the typical collector. That´s why Steiff´s series of replicas has been so popular. These pieces are amazing recreations of valuable vintage items; replicas that are often difficult to distinguish from originals. Our 1929 Teddy bear is a perfect example. Our designers exactly replicated the original Teddy´s delightful facial expression, oversized cupped ears, and smaller eyes and nose. Our craftsmen made the bear using original materials: white Steiff Schulte mohair, glass eyes, and an underscored button. The result is a valuable Teddy bear that any true collector would be proud to own.